Painting of Sallie Ward Beretta. Image available on the Internet and included in accordance with Title 17 U.S.C. Section 107. BERETTA, SALLIE WARD (1873–1964). Sallie Ward Beretta, clubwoman and civic leader, was born in 1873 in Austin, Texas, to John R. and Louisa (Hartsook) Ward, who were originally from Virginia. After attending Beechcroft College in Tennessee (1888–90) and the University of Texas (1891–93), she married banker John King Beretta of San Antonio, on December 9, 1896. The couple had one child. Portrait of Sallie Ward Beretta. Courtesy of Stephen F. Austin State University. Image available on the Internet and included in accordance with Title 17 U.S.C. Section 107. Mrs. Beretta's official involvement in public affairs began in 1912, when she was appointed by President Woodrow Wilson to a four-year term as state chairman of the High Cost of Living Campaign. In World War I she volunteered for the Red Cross and worked at army hospitals. Throughout the 1920s and 1930s she held numerous San Antonio civic positions, including the presidencies of the City Federation of Women's Clubs and the San Antonio Council of Girl Scouts. Her involvement in these two groups led to her collecting bluebonnet seeds with Girl Scouts and then launching a campaign through the federated clubs to distribute them for planting on Texas roadsides and areas outside the state. This endeavor earned her the nickname "Bluebonnet Lady." Also as president of the Federation of Women's Clubs she pushed for improving the quality of motion pictures for children while making the prices more affordable. Later, when she served as state chairman of the Texas Federation of Women's Clubs Motion Pictures Committee, she organized a Woman's Day that featured benefit shows at theaters across the state. The visibility and success of her work through the federated clubs led to her being asked to run for mayor and senator, offers that she declined. She did, however, accept a position as president of the board of directors of the Witte Museum Association in San Antonio; she was the first woman to hold this position. She also served on the San Antonio planning board and charter-revision committee in the 1920s. She was vice president of the Broadway National Bank for a number of years and served on the board of directors of the First National Bank. Beretta was on the Stephen F. Austin State University Board of Regents in 1949. Courtesy of Stephen F. Austin State University. Image available on the Internet and included in accordance with Title 17 U.S.C. Section 107. Painting of Sallie Ward Beretta. Courtesy of Texas State University Libraries. Image available on the Internet and included in accordance with Title 17 U.S.C. Section 107. Mrs. Beretta was named to the board of regents of state teachers' colleges in 1933 and served for eighteen years, during which she was usually the only woman on the board. She was selected to chair the committee overseeing Southwest Texas State Teachers College (now Southwest Texas State University) in San Marcos for twelve years. In 1947 her fellow members voted to name a women's dormitory at Southwest Texas in her honor. She presented the school with a gift of 125 acres on the Blanco River near Wimberley in 1951. 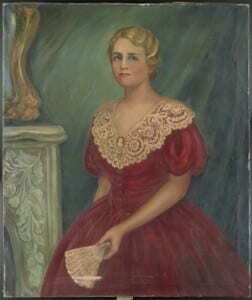 Sallie Beretta's other civic work included membership in the Colonial Dames of America, the San Antonio History Club, the Housewives League of San Antonio, the United Daughters of the Confederacy, the National Board of the Girl Scouts, the Women's Democratic Committee, and the Daughters of the Republic of Texas. In 1950 she contributed money to the DRT to assist in establishing a library at the Alamo. She lived in San Antonio throughout her adult life and died there on November 27, 1964. San Antonio Express, November 28, 1964. San Antonio Light, May 3, 1981. "Texas Women: A Celebration of History" Archives, Texas Woman's University, Denton. Vertical Files, Dolph Briscoe Center for American History, University of Texas at Austin. Who's Who of American Women. Handbook of Texas Online, Debbie Mauldin Cottrell, "BERETTA, SALLIE WARD," accessed April 18, 2019, http://www.tshaonline.org/handbook/online/articles/fbe85. Uploaded on June 12, 2010. Modified on August 10, 2017. Published by the Texas State Historical Association.